I’ve spent a good chunk of December working with my coaching clients on what they want for 2014. In between calls, I’ve been planning my January programs on achieving goals while staying sane. And I’ve been working on my own goals, intentions, and plans for next year. With all these visions of planning and achieving dancing in my head, it seemed only sensible, not to mention timely, to write on the same topic for this newsletter issue. But I decided to write about something even more important to success and happiness than planning, goal-setting, or intention-making. 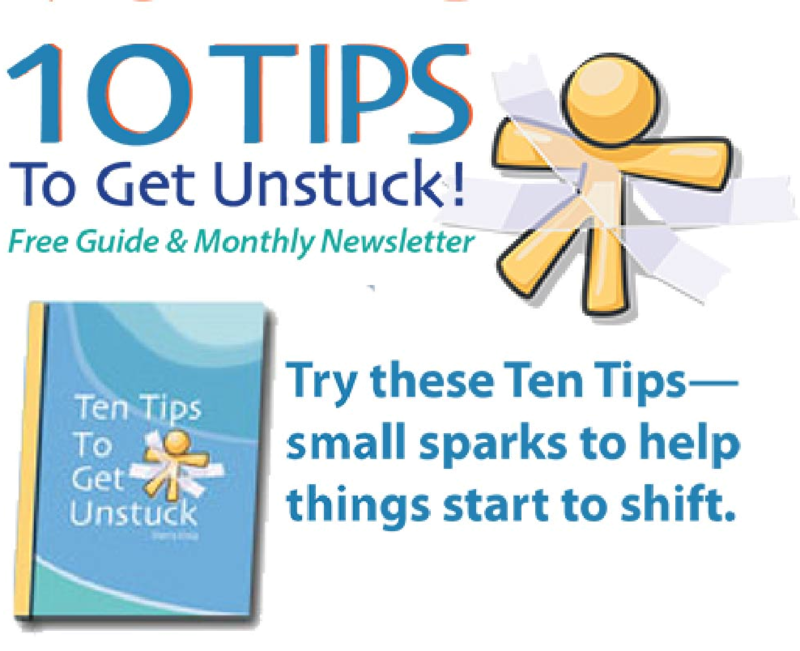 I decided to write about the foundational tools, practices, and principles we all need to get unstuck and/or stay unstuck so we can keep going on those goals, intentions, and plans. Without an obstacle-zapping fairy godmother watching over us, we all inevitably hit bumps, get derailed, feel stressed, flirt with discouragement … and find ourselves in the middle of a stuck moment. But that’s not what trips us up on the path to success. What trips us up is staying bumped, derailed, stressed, discouraged … stuck. Fortunately, you don’t need a fairy godmother to help you avoid getting, or staying, stuck! Use the following 14 tips consistently, and you’ll have a stay-unstuck-so-you-can-create-what’s-important foundation that’s even more reliable than a fairy godmother. 1. Breathe. Take five deep, mindful breaths every hour or two. It will clear your head, help you be more present, and reduce your stress. And the moment you feel stress, irritation, frustration, or overwhelm coming on, stop and take another round of deep breaths. It’s quick, free, and you can do it anywhere. You get a big a return for just a little effort! 2. Practice curiosity. When you’re curious, everything is interesting. And when everything is interesting, you catapult yourself into learning and discovery mode. is the difference between flowing through the bump … and getting stuck on it. 3. Embrace baby steps. You can always take an itsy-bitsy step forward. And on those days when itsy-bitsy feels daunting, find an even smaller step. 4. Listen to your intuition. Your intuition (or gut or heart – choose your favorite word) is far more brilliant than your brain. We live in a culture that values head-based reasoning and solutions, yet it’s almost always our minds that get us stuck. You’ll be surprised by the clarity of the answers you’ll receive. 5. Mind your mind. You get to choose what you keep in your head … mindset, self-talk, and all the other thoughts floating around in there. 6. Pause for a few seconds between tasks and activities. A close cousin of breathing, building in pauses throughout your day is a fabulous antidote to running on autopilot and losing sight of what’s most important. 7. Ask for – and accept – help. It will make your life easier. 8. Indulge in a timed vent, 15 minutes maximum. Whatever it is that has you worked up, grab a friend or your partner (as long as he/she isn’t the cause of the vent! ), ask them to set a timer, and blast it out. And when the timer buzzes, stop. 9. Have fun. If there’s no fun, what’s the point? 10. Practice self-care. There’s nothing self-indulgent, selfish, or self-centered about self-care. The better you care for yourself, the greater your successes will be in every other area of your life. None of us really learn by just hearing (or reading) something. And none us really learn by just doing something. Learning gets embedded in our cells when we take the time to reflect back on what has happened. 12. Connect with your peeps. Surround yourself with people who build you up, support you, and like you for who YOU are. 13. Be YOU. It is NEVER inappropriate to be who you are. In fact, just the opposite … you will always do your best work, have your greatest impact, and be happiest when you are authentically you. 14. Grant yourself permission to be human. You’ll be brilliant, messy, fabulous, and imperfect. Sometimes (most of the time) you’ll do and say exactly the right thing. And sometimes you’ll do or say the most spectacularly wrong thing. Some days, you’ll make glorious progress, and then you’ll have days when everything goes backwards. You get to have all of it because you’re human. Here’s to a healthy, happy and unstuck 2014!! !